Providing Assistance and Advocacy through Learning and Service (PAALS) programs provide Birchwood families the opportunity to be engaged in community activities, service learning projects, student leadership development, and much more! PAALS programming provides valuable opportunities not only for Birchwood students, but parents and the entire family as well. 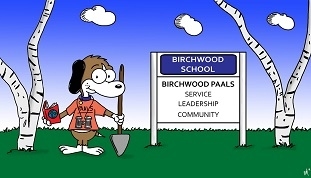 Participation in the Birchwood PAALS Leadership Academy is open to Birchwood 4th and 5th grade students. The purpose of the program is to provide students with an interest in leadership development an opportunity to explore and cultivate the skills needed to become an effective leader within peer groups and out in the larger community. Students will learn about the behaviors and practices of effective leaders and will have the opportunity to practice these skills in a select number of service or community projects chosen by the students based on group consensus. Students will be supervised and supported throughout the entire process of project development and execution. Students do not have to exhibit leadership qualities to join the academy. The only “requirement” is an internal desire or drive to learn more about what leadership means so they can start down the path to become confident and successful youth leaders. Special attention will be given to ensuring respect and collaboration. The goal of the academy is to provide students with an exciting, challenging, engaging, and FUN opportunity for them to learn and grow! Students meet two Wednesdays per month from January to June. This 10-week program in early spring provides a chance for next year's incoming kindergarteners and their parents to experience the Birchwood environment and meet Birchwood staff and future classmates. At each meeting, preschoolers have a 30-minute story time in the Media Center (usually from 1:00-1:30) followed by a 20-minute activity time in the gym. They finish up with a fun party to celebrate their time in the program! The program ends with a morning "practice" bus ride that starts around 9:30 AM. More details are on the registration form (coming soon!). Every fall and spring Birchwood offers fun and fantastic after school classes for all interested Birchwood students. Most classes run one day a week from 2:15 – 3:15 pm for six consecutive weeks (skipping half days and holidays; see schedule for specifics). Pick-up is promptly at 3:15pm. Offerings vary but may include: Lego Robotics, arts & crafts, chemistry, gym classes, cooking, cupcake-making, Spanish, chess, Harry Potter, and more! Classes typically cost between $15 - $40. The fall schedule is sent home with students the first week of school, and the spring schedule is sent home in January. There is a two-week registration period. Each classes has limited seating. CLASSES ARE FIRST COME, FIRST SERVED! Arts in Education brings educational and entertaining acts to Birchwood for school assemblies. Giant kudos to A&E Chair Cheryl Gerstler for bringing these fantastic programs to Birchwood! The Arts In Education Committee triumphantly presented Opera Saratoga's 2014 "Opera to Go" Program performing The Billy Goats Gruff at Birchwood on Friday, March 14, 2014 at 9:00 AM for all students (K-5). Find out more about the program and the show here! There's also a fun and informational guide about the show that both parents and teachers can use to talk about what kids experienced during the show. On Tues., February 11th, 2014, students enjoyed two of performances of THOMAS EDISON: INVENTOR, LECTURER & PRANKSTER with Patrick Garner, presented by Theatreworks USA and History’s Alive! See a description of the show and a preview (at the bottom of their webpage) here. A bio of Patrick Garner and a history of Theatreworks USA can also be seen here! On November 19th, 2013, Birchwood students had a ball (and a hoop, and some flying bats, and MORE) during a "Character Building" assembly with the fantastic high-energy juggling duo, the TARDY BROTHERS! The Birchwood aquarium is located in the school cafeteria. The 55-gallon heated tank contains several fascinating varieties of African Mbuna cichlids, a freshwater fish hailing from African Lake Malawi. Hospitality and refreshments at the Birchwood Newcomers reception in August and Kindergarten Orientation in May provide a warm welcome to families joining the Birchwood community. Upcoming events and important dates are posted on Birchwood's roadside sign (at the school entrance) on a monthly basis during the school year. Junior Achievement teaches kids about money management and how business works. Each classroom has a Junior Achievement Parent Volunteer who works with the teacher to schedule fun, activity-oriented lessons. The six-week program is tailored to each grade level and has a theme that fits with the classroom social studies curriculum. Materials are provided by the national Junior Achievement program. The Park has its very own webpage HERE! A fun community event held in May, including food, games, rides, craft tents, giveaways from local merchants. The day begins with a parade that includes a group of students, parents and staff from each of the five elementary schools. And every 5th year (the elementary schools take turns), a committee of Birchwood students, staff and parents work together to build a float for the parade! Birchwood's 2012 float was amazing (see photo at left); our next float in 2017 will be equally fantastic! Kids can earn $30 for their final, end of year report card through the Great Grades program! Free coin machines! Turn coin into cash at CAP COM locations! Students can conveniently deposit money into their accounts right at school. Signup is easy! Click 'Open My Account' to get started. Friendly Cap Com Reps Jessica and Dan or our Parent School Banking Reps will be waiting to accept your child's deposit on the next School Banking Day! The Birchwood Yearbook includes full-color portraits and candid photography of all grade levels, plus special subjects and a fun tribute to the graduating 5th graders. A limited number of yearbooks are available for sale after delivery. Join next year's Yearbook Committee! Your kids make memories at school, and the Yearbook Committee helps capture them! Want to help create next year's Birchwood yearbook? Page designers are needed for every classroom. No experience necessary and the group has a blast! Please contact Millie Gnatek if interested at bradleycleo@gmail.com. Kick off the new school year by photos for the "First Day of School" yearbook page. Parents can submit photos of their kids waiting for or getting on/off the bus on the first day of school. Either individual or group shots are fine. Parents and other Birchwood community members are also welcome to send in other Birchwood-related photos for yearbook consideration all year round. Email digital files to birchwoodyearbookpics@gmail.com or send the hard copies or a CD-ROM in an envelope to school.